THE BLACK BOX Classical Series presents Quartett Giocosa in collaboration with pianist Irina Kotlyar on Sunday, November 18 at 4 pm. Violinists Heather Goodchild and Irina Fainkichen are joined by Irina Naryshkova on Viola, cellist Elizabeth Schultze, and Irina Kotlyar on Piano to perform the E flat Major Quintet, Op.44 by Robert Schumann and the Quintet in A Major, Op.81, by Antonin Dvorak. Cocktails and tea will be available. Quartett Giocosa was formed in 2017. 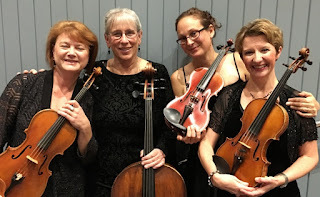 The quartet players met years ago at the Cape Symphony, where they are all members. Collectively, the members of QG have played with master musicians including Yo-Yo Ma, Joshua Bell, Mstislav Rostropovich, Anne Sophie Mutter, Mark O’Connor, Wynton Marsalis and Sarah Vaughan. They have worked under the leadership of conductors such as Christoph Eschenbach, Michael Tilson Thomas, Jane Glover, Lorin Maazel, Seiji Ozawa, and the incomparable Jung-Ho Pak and have played with orchestras including the Bergen Philharmonic, the Royal Danish Orchestra, the Atlanta and Oklahoma Symphonies, the Boston Lyric and Chicago Opera Companies and the Upsala Chamber Orchestra. Irina Kotlyar, born in Kharkov, Ukraine, earned her degrees from Rubin Academy of Music. With Gregory Shifron, the Kotlyar-Shifrin Piano duo has won several International prizes and awards, including the Murrey Dranoff International Two Piano Competition (1999, Miami,) and an International competition in Poland (1999), and has performed throughout Israel, Europe and America. Tickets can be purchased by visiting www.theblackboxonline.com or by calling the box office at 508-528-3370.